Definitely a music guru, old new, things you never heard before :) stay away from HipHop and a lot of country lol what kind of trucker doesn't do country? I'm just going to jump to my three month mark, good, bad, ugly, i took off the right side of my bumper backing into a dock with a sloping curb, hit a low hanging branch cracking my canopy, even had Another driver take off my west coast mirror, i successfully drove through New York city, New Jersey, got lost a few times, cut an hour off of a trip because i did so well. Been through Canada, Georgia, Connecticut, Virginia, incredible sights, incredible places. Suffered through the snow storm that hit buffalo not too long ago. Hit my docks on first tries, taken half hour to back in properly. Stuck on the side of the road because i messed up hours of service, Sat and talked to other drivers for hours picking up tips and ideas. To this point, it's been quite an adventure. And i have to say, last drop, i nailed it. One shot back into a tight spot, learning my routes, confidence is high, i do love what i do. No matter how many times i told myself i was quitting, and believe me it was a lot lol, i can't imagine doing anything else. The freedom, the fun. The knowledge of what i am really doing. Its a rush. Fast forward a few weeks, My backing is still a little sloppy, i avoid truck stops that are really packed because I'm too nervous about hitting a spot and feeling like a damned fool, silly i know, but pride and all that jazz. I've gotten lost, been fifty miles out of route because i missed a turn and didn't realize it, I've backed into what looked like incredibly hard docks, happy with my progress. Finding gears more than missing, getting the feel for my truck, for how tight i can make a turn, for how to judge side clearance. Getting used to the off sleep schedule, but absolutely loving what i do. Using the rookie card to score a free shower because i didn't have credits lol. A new fleet manager because my guy quit, getting better at understanding my atlas and where rest stops and truck stops are. Knowing when is a good time to start looking for a place to park. So many things. Rather overwhelming at first, Sometimes close to tears of frustration, most times just floored at how far I've come since starting school... I love what i do! Lol, no crazy machines, promise! So, your heading out with a trainer for phase two now? If so, your going to be fine... I was nervous as he## when i went to meet my trainer. But, they really are good peeps. That's great news! The agility test was... Goofy lol Just three squats, three times picking up a 40 pound box and one time pretending to climb up on a trailer. They checked my heart rate after each test... Nothing huge. And blood pressure. Mine is a lil high cos I'm a smoker, but again no worries. Going to Fox valley? Would enjoy your thoughts on it! I'm going to post my... Thoughts on being just over a month out solo today, hopefully it gives you a little insight. Feel free to ask any questions! Everyone here is terrific with info! Winter is on the way... any thoughts? Well, father winter is coming fast around the north east here, Ran in to my first bout of snow the other day. I've heard a few stories about parking when it gets bad, how truckers are parked double and triple in areas, i can imagine it's not easy to find parking. Entrances I'm sure are loaded with plowed snow... Other than the usual advice of parking early, not always an option, any thoughts there? Still wearing the rookie pants, i find it difficult even now before it gets bad to find a spot before i run out of hours and have to stop in places I'd rather not. Northeast region at times can not be friendly for me. The learning curve is very steep. No u turn means it takes a ton of room to u turn s 70 foot truck, risk of damage is too high. Most companies do not allow you to do them,. Lol button, I'm finding the truth to be much more interesting than my initial research showed me, it's quite the adventure being a trucker. Still wouldn't trade it for the world! Experienced drivers such as you, instructors like mountain girls, rookie like me. It's worth it to sit here in New Jersey watching the wind blow the leaves on the wonderfully colored trees while the sun is shining...off to Ontario...then? Who knows. I love that i chose to do this. I enjoy the stories you all share, i enjoy my own foolish ones. Lol, i suppose it's all part of driving. After a nice relaxing weekend with my kids, i found myself with a relay load going too Ajax Ontario. The confidence is back, leaving the errors in the dust. Delivered without a hitch. Now off to dreaded New Jersey lol You guys (and gals ;) ) rock! Thanks for everything! Mountain girl, i had the same problem with my trainer. More often than not he would tell me. Turn right, left, etc. Not leaving me to learn myself. It took its toll i think, since I've been on my own, a whopping three weeks lol, I've figured out more than i did while training. It's actually easy to focus on what your doing and ignore the guy staring you down As you are Backing into that spot. But I've found that a lot of truckers are very kool and understanding. I've been spotted without asking, given a thumbs up with smiles after i finish, and generally just great guys. Do what you have to do, if it takes fifteen minutes, so what. Better to do it right than in a hurry. Best part of the job, lol, crazy places you have to get in to... Beautiful truck! Where were you when i was learning backing! For a 90 back, into wasn't until i met my trainer that i was shown an easier way to do it. As close as i can to the spot on my left. Scare the mirrors he would say lol. Once my drive wheels are on the center of my spot, stop and turn hard right go until the tractor is facing straight forward. Ignore the mirrors, only through the windshield. Then stop, turn hard left, forward until the tractor is straight. Again. Ignore the mirrors (for all intensive purpose. Of course watch for unexpected things). If you follow GOAL you will see that your rear end is perfect. Keep the wheels straight and start backing, adjust as you need and bam, your good. One pull up to straighten out and your parked. Terrific! Andy...since you're basically a neighbor "Buffalonian", what school did you go to or did you do company training. Curious. Looking forward to reading more of your "rookie" posts. I'm sure I'll be running into the same things in a few months. Be safe out there. Go Bills! Jimbo, as buffalonians we know the "Aww crap" feeling. How many super bowls? Ha... 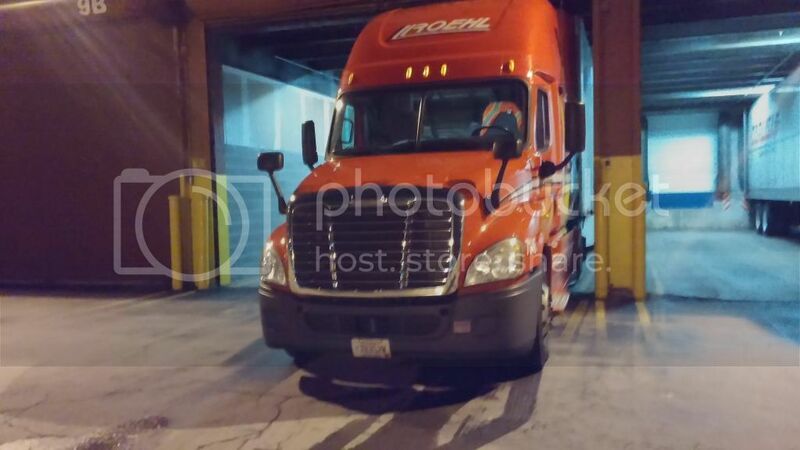 I chose Roehl trucking based on recommendation from a friend who drove for them. They are a training company, but great people. I put this all under file under ROOKIE, but seriously, the achievements are great too. Backing my truck for the first time into a dark enclosed dock, a blind side back around a corner (seriously!) without a hitch. The fist pumping hoot and hollar things that just make you feel great. I put my errors out because we are not alone. Poop happens, just clean up and move on. Wouldn't change it for the world! First week over and I have lived to tell the tale! Congrats jolie, i know what you mean, Marshfield is a great place. The information overload is incredible isn't it. But trust me, someone who had one heck of a time getting downshift right, it will come together ha. Gets to the point where you don't even think about it. The excitement of learning doesn't end. At least not yet. I've been alone for three weeks now and i still feel that rush, despite the rookie mistakes lol. I may have an ulcer by now, j/k but it's worth every minute. Keep the great attitude and you will be fine. Let us know how it goes for you!